Hi there Doodlebug Fans! Christine joining you today with a little home decor project. Creating wreaths with my paper crafting supplies has become something I look forward to with each new season. When I got my hands on the Pot O' Gold Collection I knew exactly what I wanted to use it to create! A wreath, of course! Today I am going to show you a little bit about how I created this very simple wreath! First off you will need the Pot 'O Gold 6 X 6 paper pad. Pull out a collection of papers that you like from it. 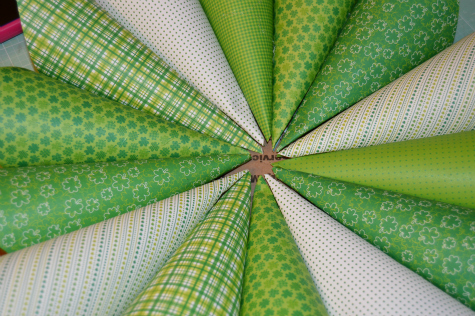 I went with the greens and whites but it would be beautiful in rainbow too! 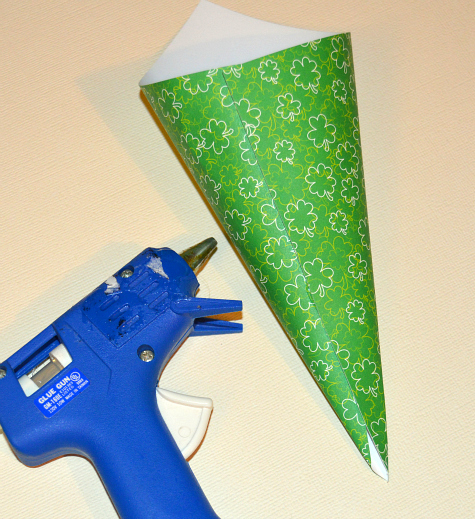 Roll the sheet up like a cone (with one tip sticking out) and secure it with hot glue. Hot glue is a definite must for a project like this...it has to dry fast and be very secure! Line up your cones on a 10 inch cardboard circle (I used an old mailing box) and make sure you are happy with the way the colors line up and you are getting things even. Then secure them to the cardboard. 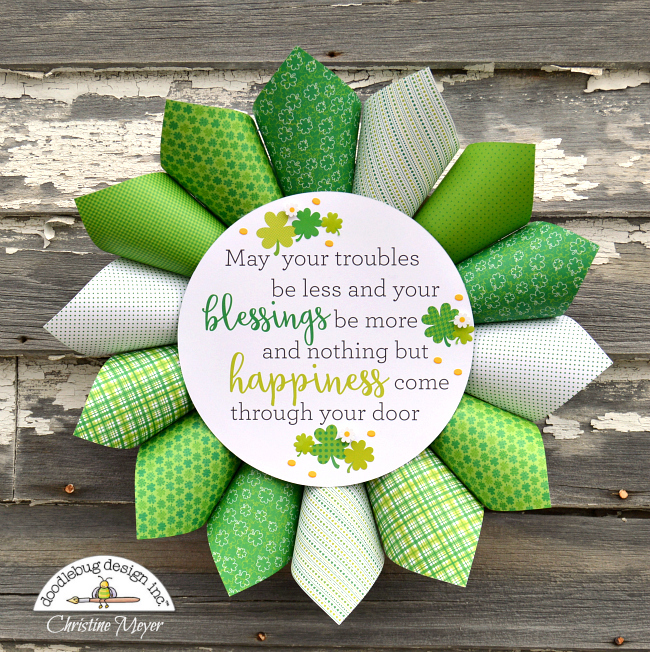 Take the patterned paper with this beautiful quote on it and cut a nine inch circle around it and use that as the center of your wreath. 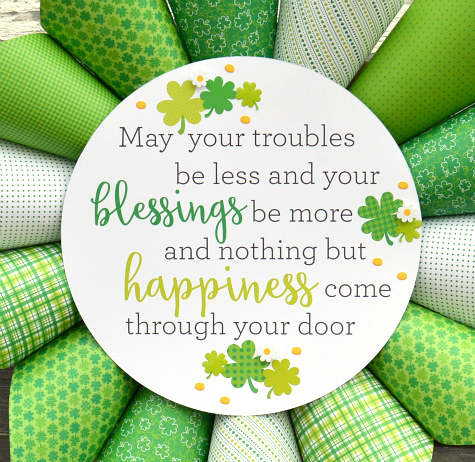 Add accents to the shamrocks that are already on the sheet by using shamrock cardstock stickers, the shamrock sprinkles, and some gold coin stickers! Add a ribbon to the back and you have the perfect piece to welcome guests into your home! Such a great idea! Like be! Really wonderful and also so simple to make...I love it!!!! What a very cute wreath! So simple...but doodlebug just makes me smile, so I love it! 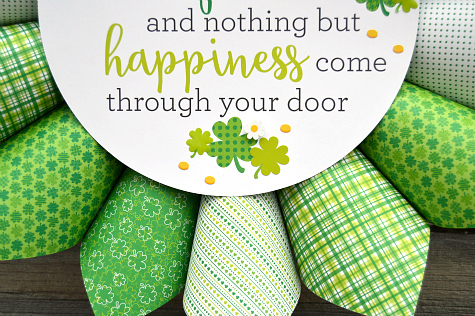 What a fun St-Paddy's day craft! I love all the patterned papers and that wonderful quote! Gorgeous! Fun project Christine, great idea! This is so cute Christine.